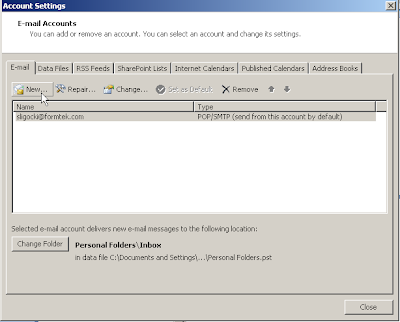 A new feature from Alfresco version 3.2 is the ability to mount the repository within email clients that support IMAP. I thought that I'd give it a try and I found that it is pretty easy to set up. 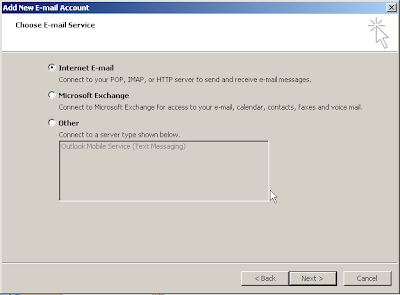 I'll show here what I did to get it to work within Outlook 2007 running on a Windows development machine. Since I'm running on a development machine, I typically use localhost as the root location for my Alfresco URLs. 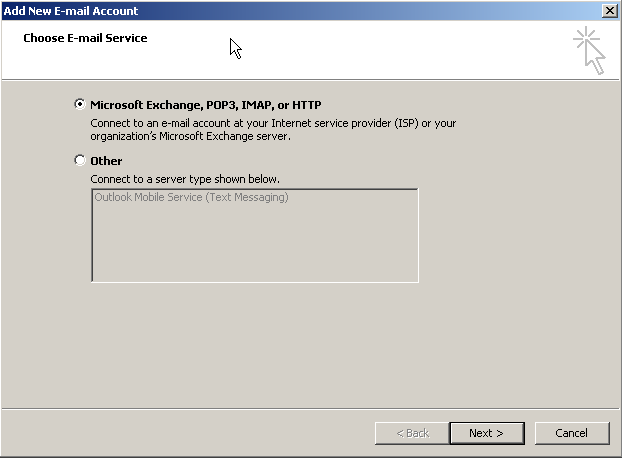 When trying to set up the IMAP user account in Outlook it doesn't seem possible to be able to define the IMAP mount point source to be localhost. The Alfresco wiki pages for IMAP also recommend against using localhost. To get around that, I defined a dummy domain name in my local hosts file. On a production machine, just use the domain name for that machine. In c:\Windows\system32\drivers\etc\hosts I added the following line at the top, leaving the entry for localhost in tact in the file (my apologies to the owner of this domain name). After making that change, I recycled the Alfresco server. 1. 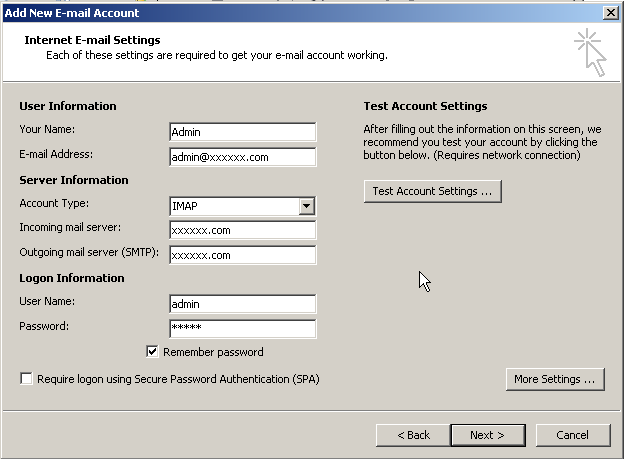 Click on the Add button of the dialog to start the process for mounting the IMAP point in Alfresco. 3. 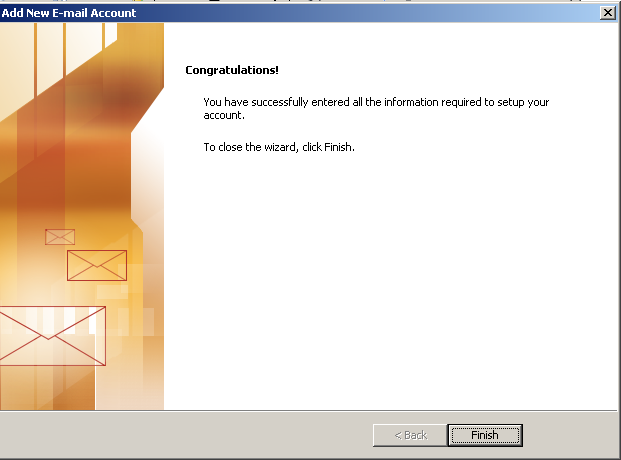 Select the option on the bottom of the dialog to "Manually configure..." and then click Next. 4. 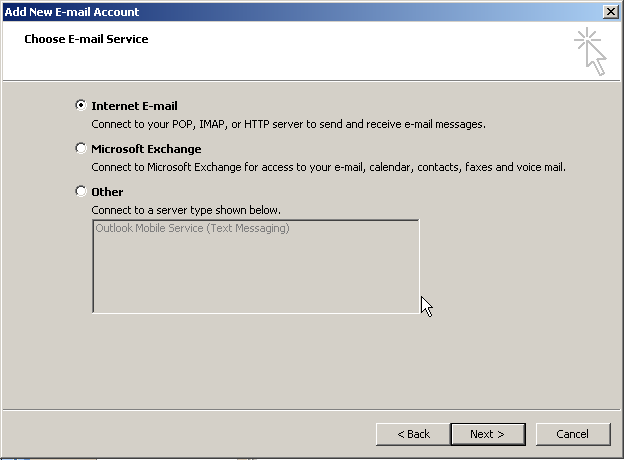 Select "Internet E-mail" which has the IMAP option, and click on Next. 5. 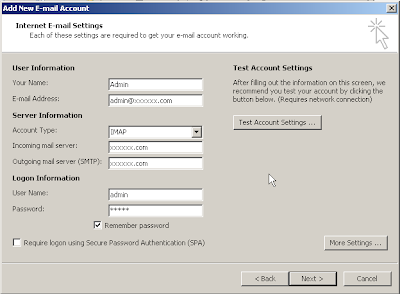 Next fill out the credentials for being able to connect to Alfresco IMAP. 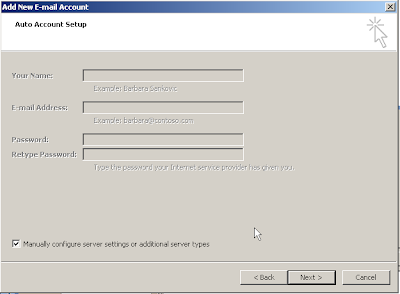 Here I use the dummy domain name that we defined in the hosts file - xxxxxx.com. 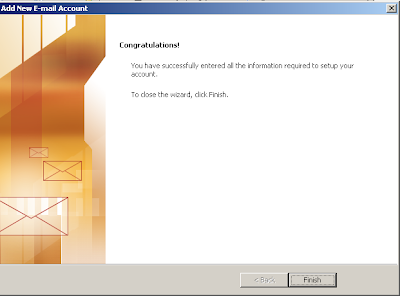 I use the login information for the Alfresco admin user. 6. Click Next and we are finished. 7. After a few seconds pause, on the left navigation panel, you should see the Alfresco IMAP Point successfully mounted. 8. 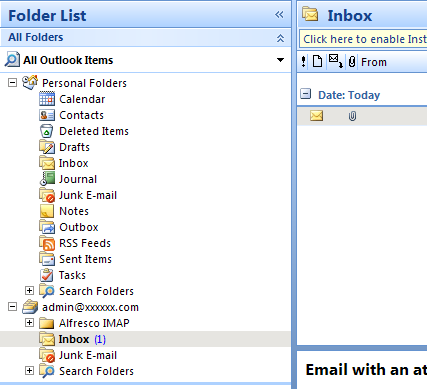 Click through on the Alfresco IMAP folder and you'll see folders of the Alfresco repository. 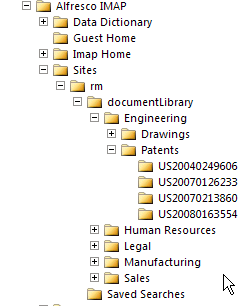 Not all folders have yet been enabled for display in the IMAP Alfresco folder hierarchy. I'm currently working with my Records Management site within Alfresco, so I log into Alfresco share, and from the Share main dashboard, I'm able to mark the Records Management folder as an IMAP favorite. 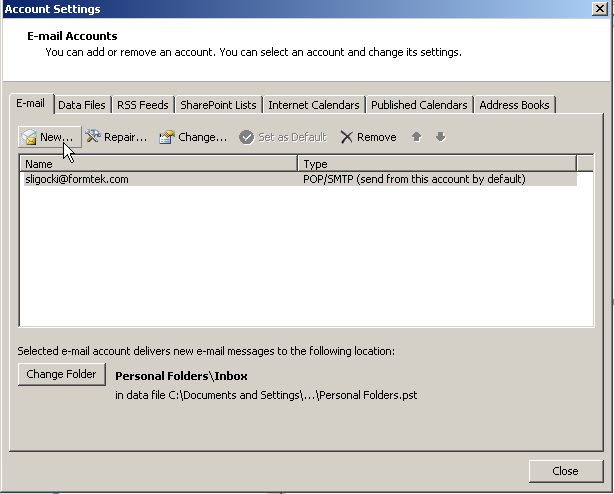 After doing that, the records management site folders also are available from within Outlook. 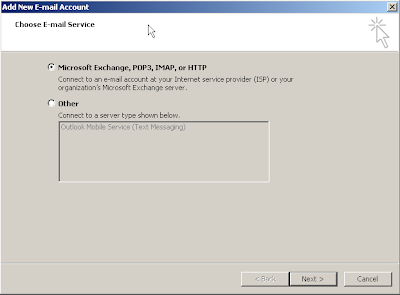 There is a new entry: Message_755.eml. Thank you so much for your posts, its refreshing to see someone who clearly states how to configure Alfresco not simply throwing statements out there about configuring this xml file or that java file. I just found these posts this week and they have already helped me loads.